Positive Negative Magazine is a print publication that is developed as a collaboration between Photography and Graphic Design students at Rochester Institute of Technology. The basic principle of the magazine is that the articles within either take a positive or a negative stance on a topic, however, each year the staff choreographs the theme, layout, composition, and aesthetic to create a unique and intriguing experience. This year, we took a humanistic approach to the theme of positive/negative. As a feature editor, I developed the concept and organized the order of the articles into a stream of consciousness. Each article flows into the ones before and after it, be it through subject matter, visual composition, or photography style. I wrote Feminist Feline Frenzy as a commentary on the current interest in feminism. It touches on the topic of redefining female roles, labels, and presence in society. 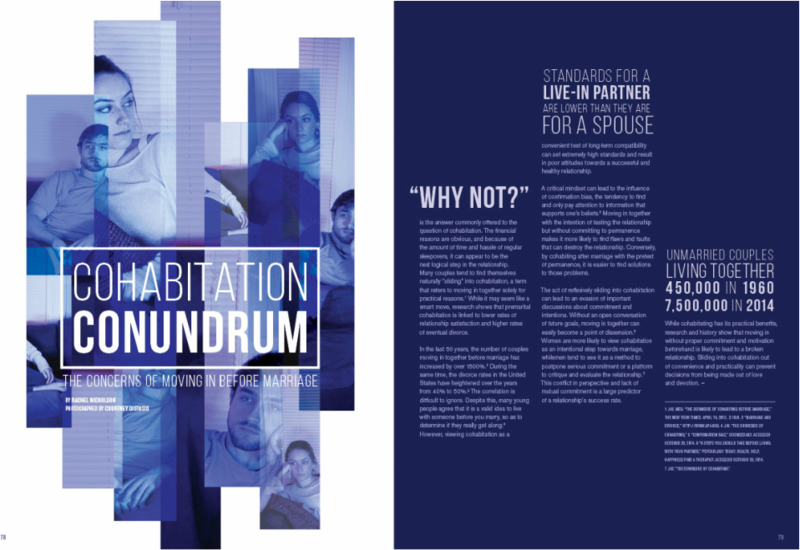 The idea for Cohabitation Conundrum came from relevant and personal experiences. Cohabitation among unmarried couples is becoming more and more popular and expected. I was very interested in digging into the reasons for this cultural shift and the benefits and consequences of this life decision. Bright White Done Right was a really fun article to write and design. I worked with Michael Murtaugh, a fashion photographer. We decided that we wanted to take a relatively mundane and practical topic and put a very fresh and high-end spin on it.